Considering the use of the so-called ‘elemental forces’ of water, fire, earth and air in public art; with examples from Melbourne’s public and street art. Although it is the space between, air is the most under used element in public art. Aside from making flags and banners flutter it is used in a couple of sculptures. The 15-metre-high wind-powered sculpture by Duncan Stemler, Blowhole in the Docklands. Elsewhere in the world there are musical sculptures that are played automatically, like Aeolian harps and the common wind chime. On a more subtle level there is scent of gardens, of incense and the burnt eucalyptus leaves of smoking ceremonies carried in the air. Water was the first one to be used for public art with public drinking fountains and other water features from artificial lakes and waterfalls. There are many fountains and drinking fountains in Melbourne there are also mist sprays on the rocks in Footscray, Wominjeka Tarnuk Yooroom by Maree Clarke and Vicky Couzins. Street artist have also used water, one summer blocks of coloured ice were left to melt in Hosier Lane, the coloured liquid running between the bluestone cobbles. The street artist, CDH used hypochromatic ink for stencil works where the piece that only became visible when wet. Finally there is the unofficial colouring of fountains and moats often in conjunction with protests. From the eternal flame at the Shrine of Remembrance, candle light vigils, to Indigenous smoke ceremonies fire is used in a variety of public art. Camp fire with Aboriginal story teller at Federation Square. It is not all sacred; there are profane gas flares at the casino and temporary public art events like, fireworks displays. Fortunately there is little use of fire in street art, aside from a rare CDH pyrotechnic painting. Earth art is the principle form of public art. From its landscaped gardens, the city is an artificial constructed landscape, complete with kitsch floral clocks. The metal and stone used in sculpture is also from the earth but that might be labouring the point. Street art also use earth and plants in guerrilla gardening. Ten years in the history of Melbourne’s street art and graffiti told with a series of artists, crews and events. Rather than another listical of notable street artists this is an attempt at a kind of chronology that points out peaks rather than beginnings and endings. In it there are artists who opened new directions, who could not be ignored, who reinvented themselves or the techniques and the idea of street art and graffiti. There are artists who have persisted along with artists who for a short time made a big impact. It is a list based on my observation of Melbourne’s street art and writing them in this blog. Drew Funk and HaHa are two affable guys, studio mates and friends on the two sides of the aerosol paint use. Drew Funk’s aerosol art and HaHa’s stencil work were once ubiquitous with the Melbourne street art scene. The power couple of the emerging illustrative street art scene. Ghostpatrol’s whimsical character illustrations and Miso’s paper cuts were fresh styles and techniques. Neither does any street art now both quickly moving into the fine art and legal murals. Both these artists expanded media of street art. Before Bali Portman and Yarn Corner crew there was Yarn Wrap guerrilla knitting. I was sceptical when I first heard about yarn bombing but I was wrong and the technique quickly became a favourite of city councils. Meanwhile, Junky Projects collecting rubbish from the street and transforming it in the most coherent and long term up-cycling project ever. The Everfresh crew of Phibs, Rone, Reka, Meggs, Sync, Makatron, Wonderlust, Prizm and the Tooth have been the most significant crew in Melbourne. The AWOL crew of Adnate, Deams, Itch, Li-Hill, Lucy Lucy, Slicer were not far behind and by changing their styles they sprayed their way to more fame. Two ambitious artists who made a big impact but are no longer actively making art on the streets. CDH was the mad scientist of the street art scene; trying out new techniques using fire, hydroactivated paint and creating conundrums for the NGV with his Trojan Petition. At the same time, Baby Guerrilla was reaching for the heavens, trying to fill the largest and highest walls with her floating paste-up figures. Both projects buffed the walls of Melbourne’s graffiti central to good effect. Adrian Doyle painted the whole of Rutledge Lane blue. And, as a curated part of the NGV’s “Melbourne Now” exhibition, the whole of Hosier Lane was repainted by some of Melbourne’s best graffiti and street artists in All Your Walls. In 2014 year both artists painted very large legal murals of big faces on big walls. Everfresh crew member Rone painted women’s faces and AWOL crew member Adnate painted Indigenous people. Kranky was a crazy explosion of assemblages, then it stopped; maybe the supply of plastic toys ran out. Tinky used even smaller toys to make her little scenes Along with other artists Kranky and Tinky revived the street art in Presgrave Place. The most irritating assholes in Melbourne’s street art/graffiti scene where there are plenty of irritating assholes. These two guys have made it a speciality. Lush does have a trollish sense of humour but he highlights a problem that is essentially for so much street art, especially murals, they are just click bait. Nost is a tagger, an aerosol bomber who hates street art. The art Astral Nadir encouraged me to look down at the sidewalk and not up on the walls. With so many walls already painted and the backs of signs covered in stickers Astral Nadir artistically exploring a relatively unused area in Melbourne. One of the unique features of Melbourne street art scene is the involvement of “Banksy’s favourite criminologist”, Professor Alison Young. Every city with a thriving street art scene has street art collectors, like Andrew King and Sandra Powell, or a blogger equivalent to Dean Sunshine (Land of Sunshine) or Facter (Invurt), or a photographer like David Russell, documenting the scene. A tall, middle age Scottish woman with blond bob, Alison Young does not look like the typical fan of graffiti and street art. I first encountered her at a graffiti forum in an art gallery, probably the way that many people do. Speaking at venues from the National Gallery of Victoria to delivering the keynote lecture at a conference, Philosophy of Street Art: Art in and of the Street at Pratt Institute and New York University in 2016. Subsequently I subscribed to her blog, Images to Live By and, would then run into her at various graffiti and street art events around Melbourne. Writing her blog was both a way of introducing herself to the street art community as a sympathetic observer and also a way of introducing her thoughts to the same community. Young has been researching graffiti since 1996. Central to Young’s examination of street art and graffiti is that our response is shaped by the way that we encounter with them. That initial moment where we are assessing what we are seeing based on how we think about where we are because the location is central to graffiti and street art. Young has written four books on the subject: Judging the Image (2005), Street/ Studio (2010) with Ghostpatrol, Miso, and Timba, Street Art, Public City. Law Crime and the Urban Imagination (2014) for which she was awarded the Penny Pether Award 2015 and, most recently, Street Art World (2016). Not that it is possible to tell where her research ends and the fan of street art begins, complete with a tattoo by Miso. Alison Young is not the only academic studying street art in Melbourne. There are other academics who are studying street art and graffiti however most are post-graduates and not a Professor of Criminology at Melbourne University. Young’s academic seniority that allows her to be influential in both the street art and academic worlds. There is an account of Young’s involvement with the City of Melbourne’s graffiti policy in Chapter 6 of her book in Street Art, Public City – Law, Crime and the Urban Imagination (Routledge, 2014). But Young’s influenced Melbourne’s street art in more ways that advising and being ignored on the city’s graffiti policy or the odd appearance as an expert witness in court. Simply by being at live sprays, talking to artists, exploring cities, writing a blog, can have a subtle but important influence. Her sympathetic but sharp and insightful mind is part of the conversation, the discourse of Melbourne’s street art. For example, there is an article about her interactions with Kaff-iene in Articulation, the University of Melbourne Arts Faculty blog. In this way her contribution becomes embedded in the local scene. See also my review of Young’s Street Art, Public City. Law Crime and the Urban Imagination. From time to time we all become concerned about money and when an artist is concerns about money it can take them in some strange directions. This gets even more warped when street artists get involved. 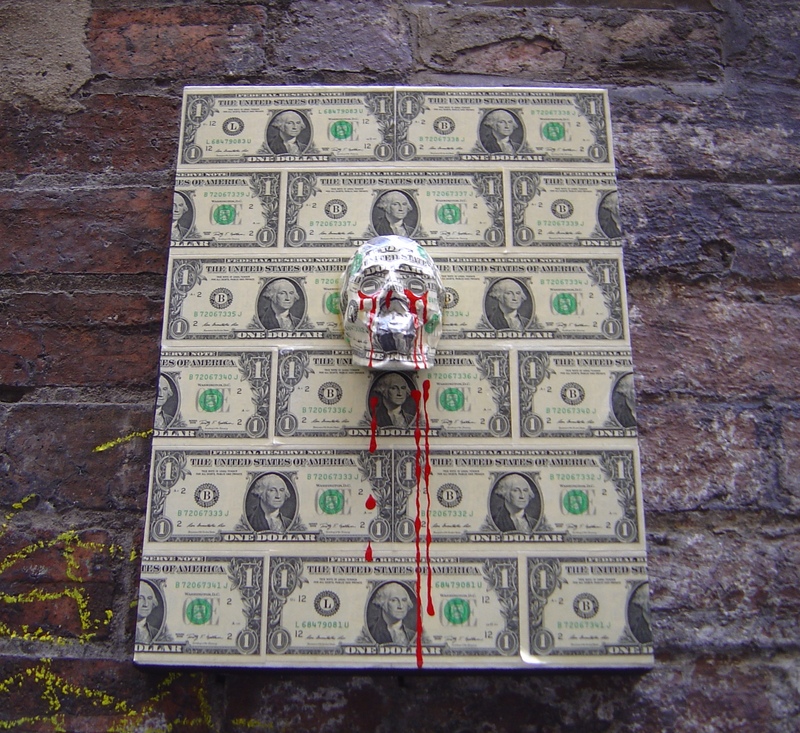 I’m not surprised that street artists feeling worried about money as most are working for free and then suddenly finding themselves in a hot market. (see my post Hot Market Dealers). Yes, but that is spare change compared to the corruption of the politicians in NSW or the corruption in sport. I am not going to start worrying about artists making money from their art until some artists regularly make more money than most company CEOs. Following the money like watching the auction prices instead of the art. It follows the popular obsession with the money trail (and the monied) is totally out of perspective and distorts or ignores the other aspects of the institutions of the art world such as those highlighted by the Guerrilla Girls (for other examples see my post on National Galleries & Nationalism). 2014 was a bad year for this obsession amongst street artists with CDH’s torn-up cheque and Art vs Reality. I am very glad that both CDH and Peter Drew have found something better to do with their time this year. Peter Drew has been much more successful with his “Real Australian’s Say Welcome” meme. 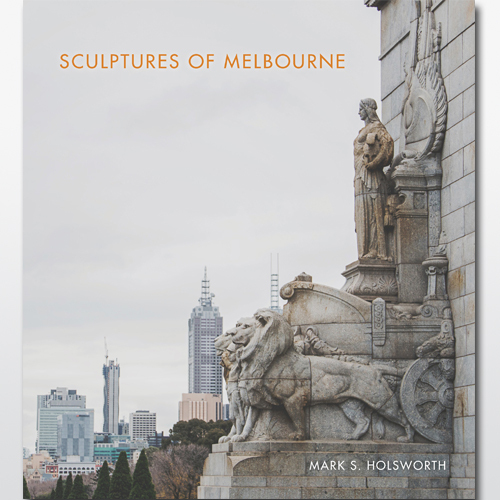 This weekend I have had two book launches for my first book, Sculptures of Melbourne. It was better than my 50th birthday party but that happened during a heatwave in February earlier this year. It was so great to see so many old friends and to actually meet people that I have only interacted with virtually online. Why two book launches? 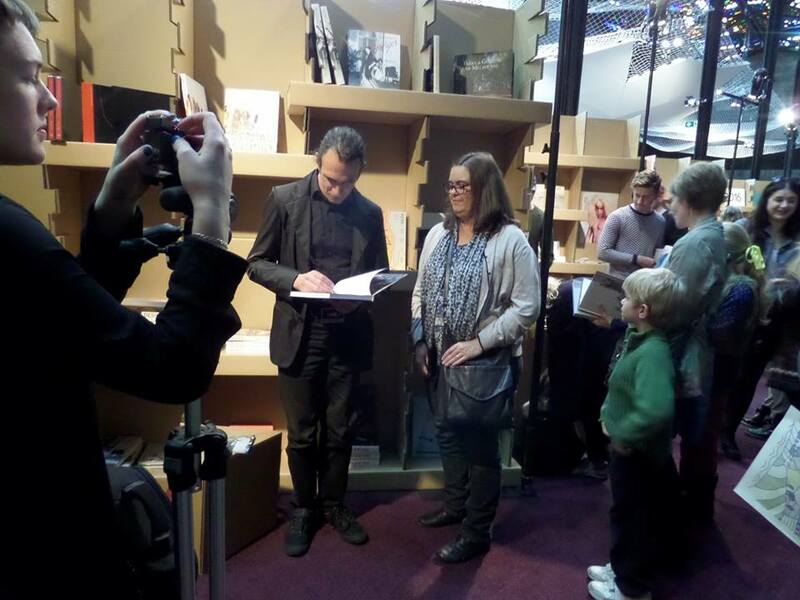 The second book launch came about when the publisher, Melbourne Books got a stall at the Art Book Fair at the NGV. So it has been a big week. I have been working social media and writing two speeches for the two book launches. The book launch at Gallery One Three was amazing, Richard Watts gave a great opening speech. Thanks to Fatima for organising the launch at Gallery One Three. I have so many people to thank for helping me with my first book, I am very grateful for all the help. You might not have thought that you have done much but think about it from my perspective where any help at the right time is so appreciated. Melbourne Art Review covered the book launch and check out the great photos by Matto who took the front cover photo for the book. 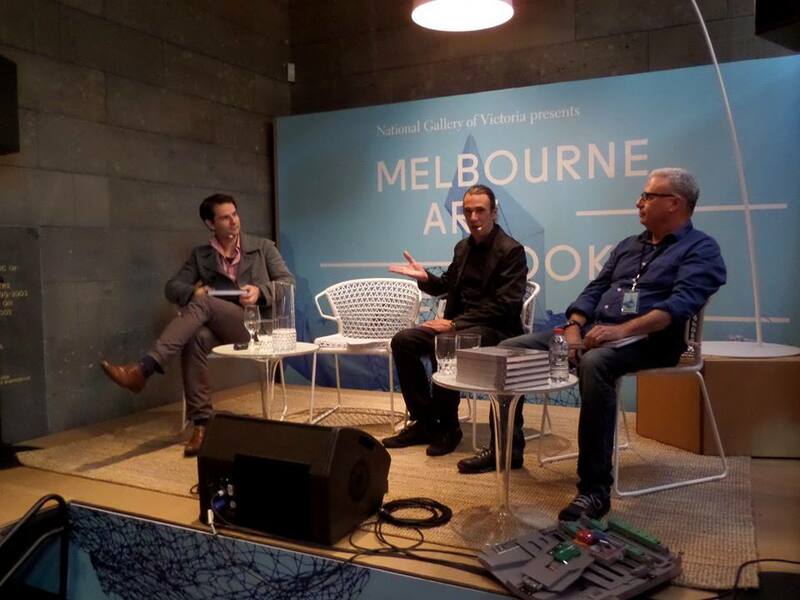 The second book launch at the NGV’s art book fair in the great hall. I got CDH to introduce me because he is in the book and I thought it would be slightly ironic after his Trojan Petition if he was officially talking at the NGV. It turns out that he is a very entertaining speaker and quickly got the audience to laugh. I talked about how I developed the book from writing about public sculpture in this blog. Then there were more books to sign. There is a video of the launch of my book at the NGV, made by Chloe Brien who edited my book and consequently is a well edited video. The art book fair is another example of the new direction that Tony Ellwood, the NGV’s director is taking the gallery. There were lots of stalls with zines and artist books. Catherine bought a couple of little publications by Gracia & Louise (Gracia Haby and Louise Jennison). Although there hasn’t been any main stream media about my book (yet) several bloggers have posted about it. Interview on The Art and The Curious. Invurt on the book launch. Art and Architecture on my book. Public Art Research mentions my book. Interview on Invurt about my blog and my book. You can buy the book, Readings bookstore stocks it, or you can borrow my book from the following public libraries: City of Boroondara Library, City Whitehorse and Manningham Library, and Yarra Plenty Library. My events page has more information on my promotional free lunchtime sculpture tours next week. Normal Black Mark blogging will resume shortly. “… as a protest against the niggardly funding of the fine arts in this hick State and against the clumsy unimaginative stupidity of the administration and distribution of that funding.” Australian Cultural Terrorists claim of responsibility for the theft of Pablo Picasso’s Weeping Woman from the NGV in 1986. Melbourne love an art scandal. This is assisted by having some top rate scandals, for example, the unsolved theft of the Weeping Woman. Although sometimes these scandals seem to be borrowed from US culture wars, as in the case of the vandalism of Andre Serrano’s Piss Christ in 1997. Art scandals have been ruined careers and lives, some of them were crimes and art has been destroyed. Melbourne never gave Vault a fair go. Juan Davila sighs at yet another repetition of the cry of ‘obscenity!’ Some of the unfortunate victims of these scandals and some naive realists might be thinking: “what has this got to do with art?” but this discourse is part of what defines art. In the wake of an art scandal, even people who have not been to an art gallery in decades will express an opinion. The media is full of the story and more comments and from the informed comments to the mad ignorant rants it is this discourse that, in part, defines art. The year of debate about Ron Robertson-Swann’s modernist sculpture Vault in 1980, although driven by local city council politics, inspired the next generation artists to think hard about art and express their ideas not just in their art but in public forums. This love of art scandals has created its own artists, CDH and Van Rudd for example, who create their own mass media interactive art works by provoking police, politicians or the public. These artists and their art are well known, although not exactly popular. Creating a scandal that goes viral is not the easiest thing to do and not every attempt succeeds in being both a scandal and art. It has also helped create the environment that fostered Melbourne’s street art and graffiti scene by giving their contentious and audacious actions a wider public eager to discuss them and collect them. These accidental and deliberate scandals are interesting because they expose the cracks in the facade of our culture and deep divisions in the airbrushed idea of a united society. These scandals raises more questions than they answers prompting further thought, action and creation.